Earlier this month, readers recommended titles, and we chose 15 books every Westerner should read to better understand the region. Our readers responded with comments, Facebook posts, and tweets. Below are many of their suggestions. 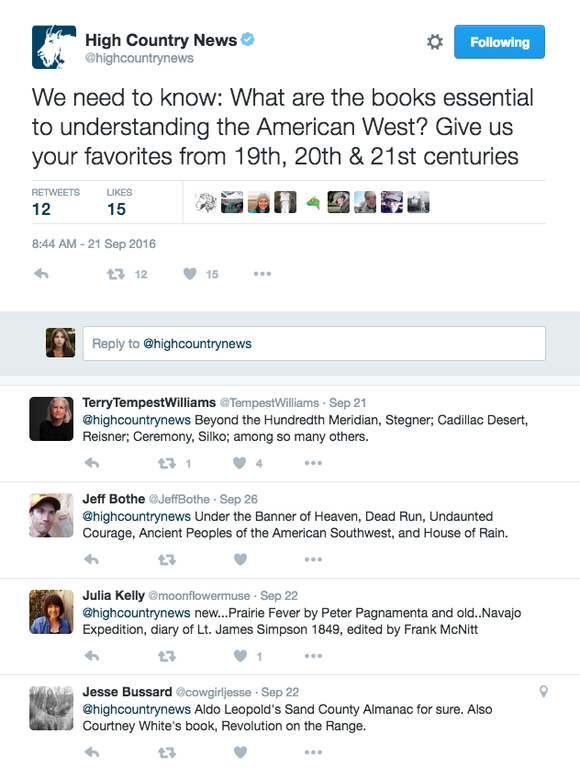 HCN received many more book recommendations from readers and contributors via Twitter. Rising From the Plains by John McPhee (Farrar, Straus and Giroux, 1987). Ceremony by Leslie Marmon Silko (Penguin Books; Anniversary edition, 2006). House of Rain by Craig Childs (Back Bay Books, 2008). In Search of the Old Ones: Exploring the Anasazi World of the Southwest by David Roberts (Simon & Schuster, 1997). Beyond the Hundredth Meridian by Wallace Stegner (Penguin Books; Reprint edition, 1992). Cadillac Desert: The American West and its Disappearing Water by Marc Reisner (Penguin Books; 2 edition, 1993). Legacy of Conquest by Patricia Limerick (W. W. Norton & Company; Reprint edition, 1987). My Antonia by Willa Cather (Dover Publications, 1994). The Way to Rainy Mountain by N. Scott Momaday (University of New Mexico Press, 1976). Balsamroot by Mary Clearman Blew (University of Oklahoma Press, 2001). The Gibraltar: Socialism and Labor in Butte, Montana 1895 to 1920 by Jerry Calvert (Montana Historical Society Press; 1st edition, 1988). 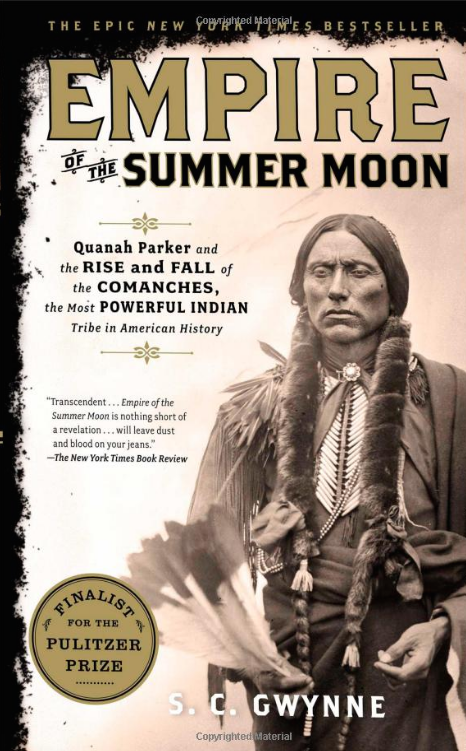 Empire of the Summer Moon: Quanah Parker and the Rise and Fall of the Comanches by S.C. Gwynne (Scribner, 2011). Giants in the Earth by O. E. Rølvaag (Harper Perennial Modern Classics; Perennial Classics ed. edition, 1999). Sometimes a Great Notion by Ken Kesey (Scribner, 1964). All My Rivers Are Gone: A Journey of Discovery Through Glen Canyon by Katie Lee (Johnson Books, 1998). Animal Dreams by Barbara Kingsolver (HarperCollins, 1990). For more suggested titles from our readers, see our Facebook and Twitter threads.